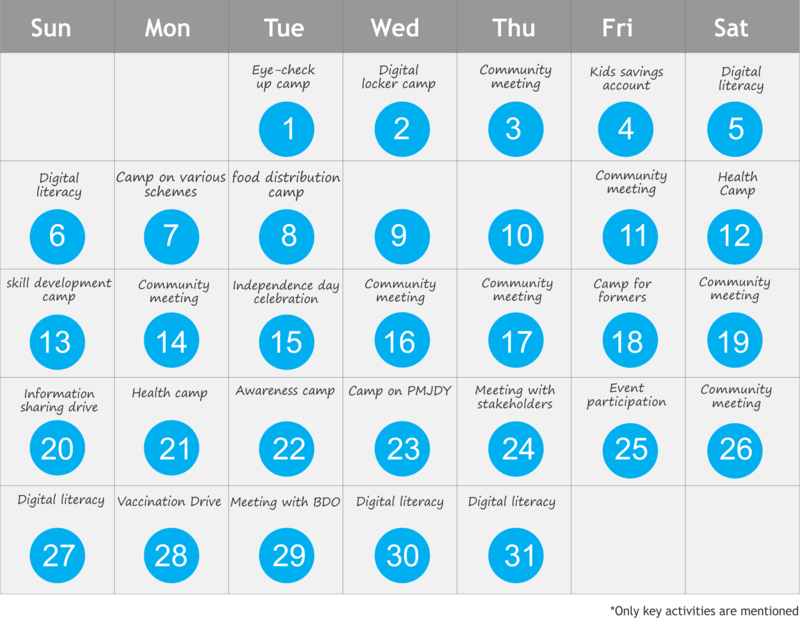 August was a busy month for all of us. We have widened our reach into few very remote locations such as Undkha panchayat(Barmer), Tengaria village (Ranchi), etc., which were otherwise ignored due to lack of poor infrastructure and bad weather conditions. We entered into many healthy discussions about various issues faced by them. As usual, we found, that the biggest problem is the lack of information. We have slowly started work in these areas to chalk out a plan on how to make the local not just literate about various Schemes and Entitlements but digital literate too. August was also the monsoon season in some parts of the country and our people saw many days of torrential rains that brought widespread damage to houses and lives. Western Madhya Pradesh was one of the regions that got affected. 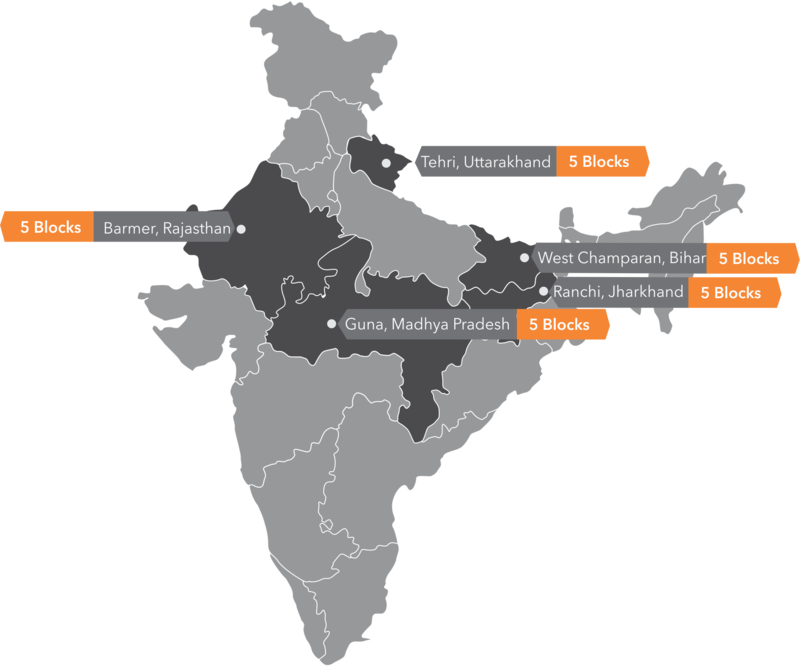 Our Soochna Seva team visited some of these areas even if they were outside our target locations. Our brave foot soldiers went the extra mile to meet the disaster-struck families and lend their support. 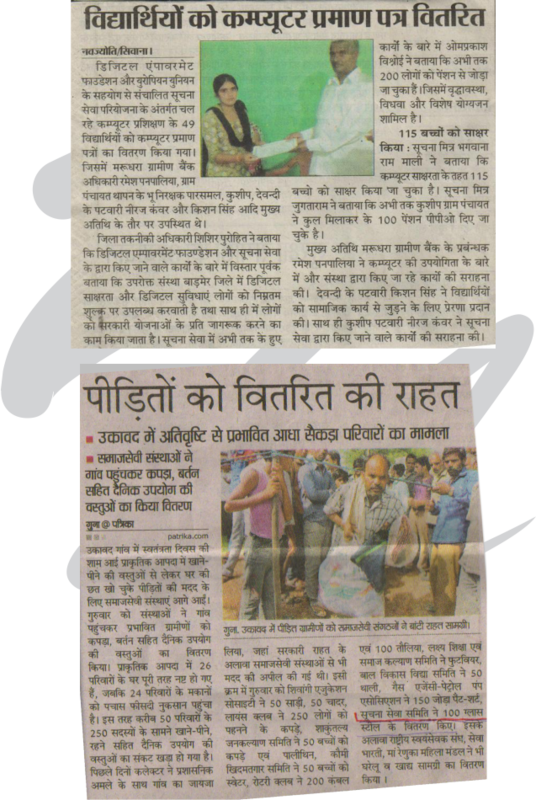 Soochna Seva distributed 50 torches and 15 pair of shoes to the Panchayat to be distributed amongst the affected families. Special thanks to Abhinav and Nagendra for their wonderful job and going beyond their immediate responsibilities of reaching out to people. Purushottam Singh is a part-time farmer and worked as a manual labourer under various contractors. Inspite of working hard he never received money on time. After applying for MGNREGA with the help of Soochna Seva team, he now receives his payment. AASHA workers of Umri village were upset about their pending salaries for the past three months. Their troubled days came to an end in the month of July when the Soochna Seva team intervened into the matter and very tactfully handled the situation. Simon Tirkey was too late to learn about the importance of animal vaccination camp and its benefits. The timely awareness camp by Soochna Seva team not only saved his dying cattle’s life but also encouraged him to provide regular health check-ups to his livestock. Locals of Ramnagar block in West Champaran complained the Soochna Sevaks about the ill-management and poor medical facilities of the PHC centre. The team comprehended the urgency of the situation and guided the villagers in writing a complaint application to the District Magistrate. Obtaining a Pension Plan Order (PPO) is a tiring process but it did not discourage the Soochna Sevaks in achieving their aim. Their hard work eased the financial tension of Gavri Devi when she received the PPO card for Old Age Pension Scheme. Sarpanch Mr. Ramesh Kumar from Dhanau Village of Dhanau Gram Panchayat speaks to Shishir Purohit, District Mananger of Soochna Seva, Barmer, when he visited the Sarpanch office on 30 August 2015. Following are the excerpts of the interview. What do you think about Soochna Seva and the services provided by it? Soochna Seva has been providing good services for the betterment of people. The best part of this project is that the people receive information under one roof without any effort. They have also begun believing that government schemes and policies are meant for providing social security and sustainability. Ruchi Kirsali has been living in Dabri Village with her 3-yr-old daughter, Yukti Kirsali. Soochna Seva team walked miles to reach the village and extended their helping hand to the people. Ruchi was not aware about the government schemes until she met Soochna Seva. Our team informed that her daughter is eligible for Nanda Devi Kanya Yojna. Before 1st of June of every month, anyone between the age group of 18 to 70 years can apply for this scheme but should have a bank account and the Aadhaar number should be linked to the bank account.A person has to opt for the scheme every year. He can even prefer to apply for a long-term option and the premium of rupees 12 per annum will be automatically debited from the account every year by the bank.